After providing quality independent journalism to Australian audiences for more than 185 years, the Fairfax brand will disappear on Monday, December 10 following completion of the takeover of the business by Nine Entertainment Co.
Quality journalism will continue to need supporters like you and the journalists’ union, the Media, Entertainment & Arts Alliance, will be closely monitoring the situation as the Fairfax mastheads come under Nine banner. Nine’s chairman Peter Costello, the board of directors and Nine’s CEO High Marks must commit to and sign the Fairfax Charter of Editorial Independence that all owners of Fairfax have signed up to over the past 30 years. 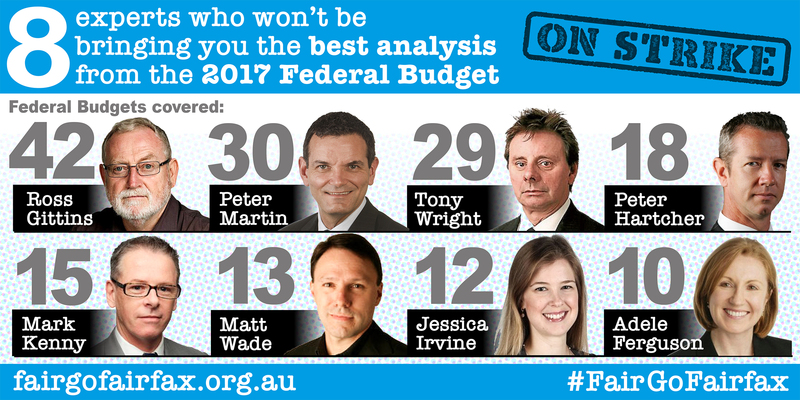 Fairfax editorial staff are the backbone of the business, acknowledged for their award-winning public interest journalism. It is vital that the journalism produced by Fairfax journalists is maintained and properly resourced, and so Nine must commit to observing and respecting the workplace agreements that are currently in place. There are still uncertainties surrounding what will happen to Fairfax businesses. The fate of more than 160 Fairfax regional and rural publications and websites is also under a cloud. 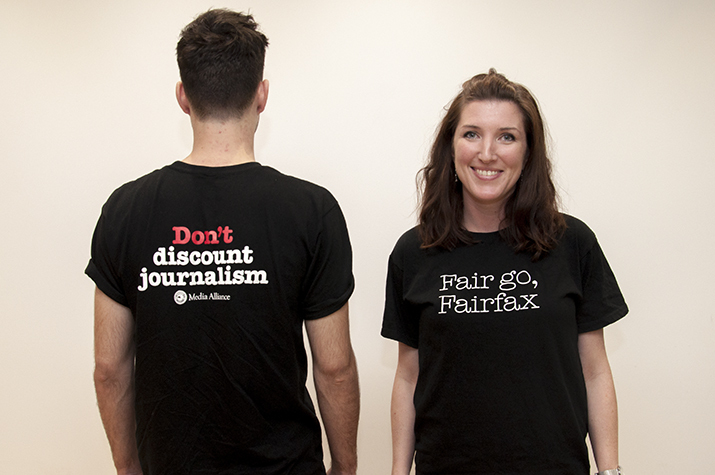 You can show your ongoing support for Fairfax journalists and their journalism as they move into the next phase of their mastheads’ journey by purchasing a Fair Go Fairfax campaign t-shirt below. 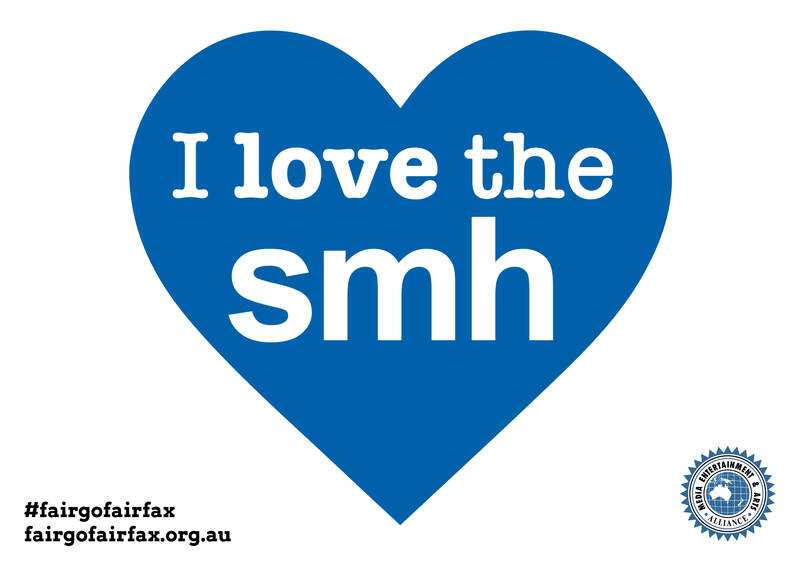 You can buy one of these t-shirts or make a donation to the Fair Go Fairfax campaign here. On July 26, Nine Entertainment Co. announced it would takeover Fairfax Media. This takeover will be bad for Australian democracy and diversity of voices in what is already one of the most concentrated media markets in the world. MEAA calls on the ACCC to block the takeover. “This takeover reduces media diversity. 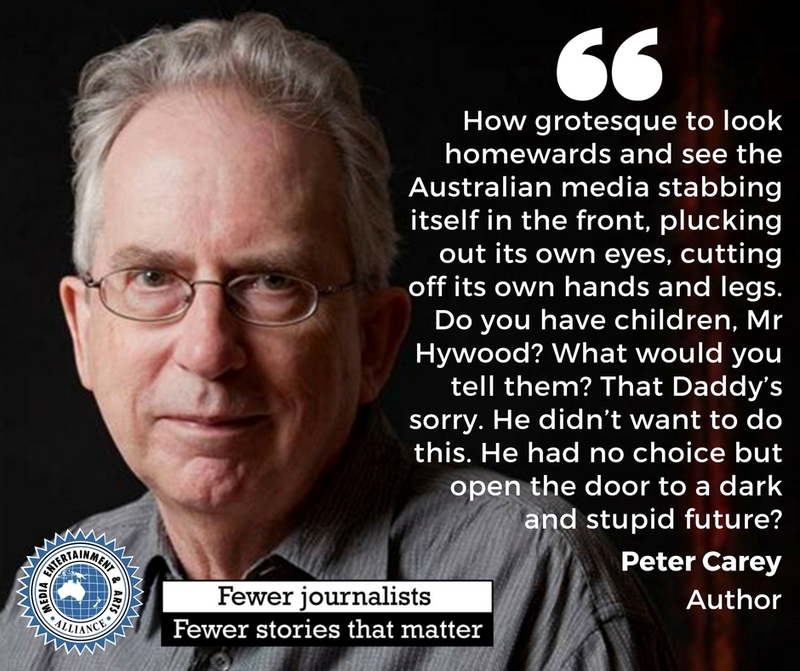 It threatens the editorial independence of great news rooms at Nine, the Sydney Morning Herald, The Age, Canberra Times, Illawarra Mercury, Newcastle Herald, Macquarie Media and more – right around the country. It harms the ability of an independent media to scrutinise and investigate the powerful, threatens the functioning of a healthy democracy, undermines the quality journalism that our communities rely on for information,” Strom said. MEAA demands that all existing employment conditions and entitlements are protected and retained for all workers at both companies; and that existing industrial agreements are respected. 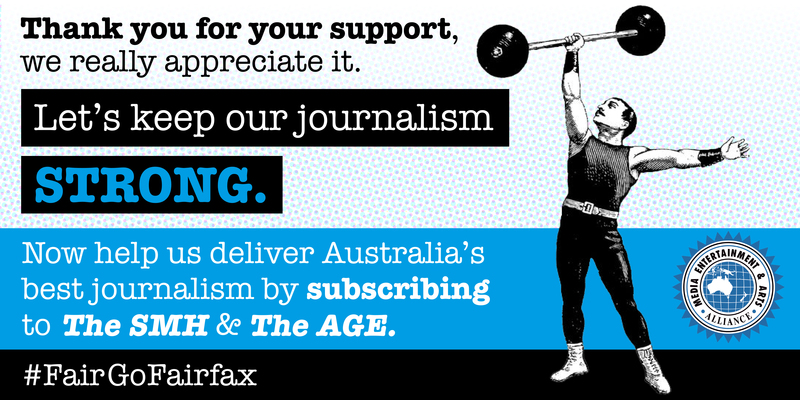 Fairfax has a proud history of investing in independent journalism. It’s in everything the company does, even the slogan on its mastheads: “Independent. Always”. Fairfax journalists are recognised for their award-winning work, scrutinising and analysing the powerful while providing news, information and entertainment for their audience. Between 2011 and 2016, Fairfax used regular redundancy rounds to cut almost 800 jobs from its editorial staff across the country. About 420 of those jobs came from the Metro daily newspaper divisions, more than 300 from its Regional newspapers, and more jobs have gone from the local Community newspapers. Those numbers don’t include attrition – where people who have resigned from the company have not been replaced. In 2017 the company made a further $30 million in cuts to its metropolitan mastheads’ editorial budget, making 25% of its remaining journalists redundant. The thing is, Fairfax newsrooms around Australia have already lost a wealth of skill and experience. For the editorial staff that remain, their workload has massively intensified, particularly as they are required to constantly write, produce and develop stories for a variety media platforms. The equation is simple: Fewer journalists = Fewer stories. Fewer journalists means less scrutiny of government, less holding the powerful to account, less public interest journalism. And that means democracy itself is undermined. 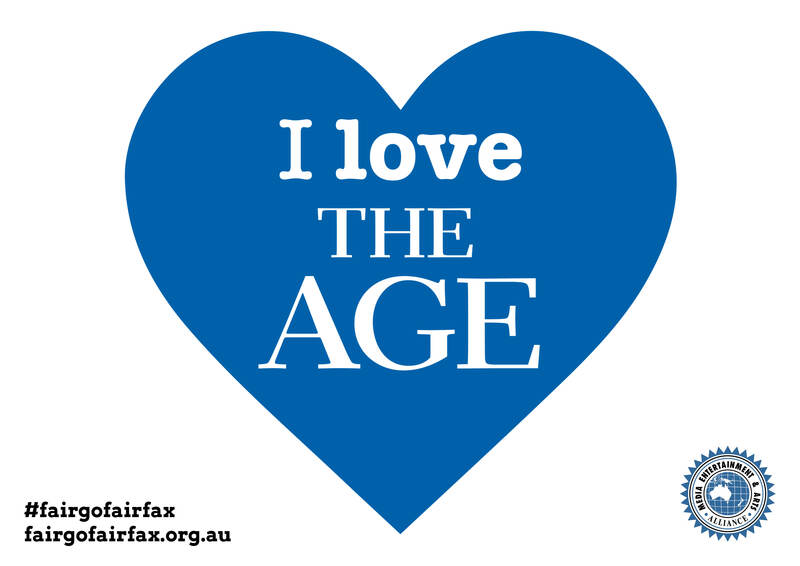 Twitter: follow @withMEAA and @fairgofairfax and use #FairGoFairfax. 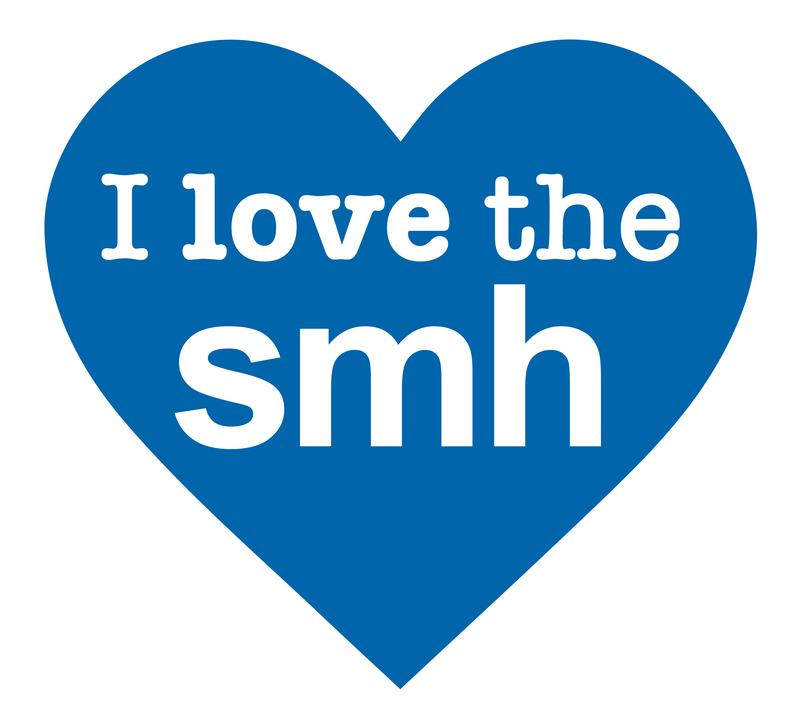 Facebook: follow MEAA, Save the SMH, and Save the Age. Sunday December 2 2018: Nine announces 144 roles redundant, affecting 92 employees, due to duplicated jobs and vacancies that will not be filled. Thursday November 8 2018: The Australian Competition and Consumer Commission will greenlight the takeover of Fairfax Media by Nine Entertainment Co. in a body-blow to media diversity, and the forerunner to future mega-deals that will reduce coverage of matters of public and national interest and do untold harm to media jobs. See MEAA’s statement here. Wednesday September 12 2018: MEAA lodges its submission to the ACCC formal review. More than 1100 people made submissions through MEAA to the Australian Competition and Consumer Commission expressing concerns about the proposed takeover of Fairfax Media by Nine Entertainment Co. The submissions were made via an online tool hosted on the MEAA website after the ACCC invited members of the public to have their say on the $2 billion-plus takeover. MEAA’s Media section has also made submission which urges the ACCC to oppose the merger as it contravenes the Australian Competition and Consumer Law. MEAA argues the merger would substantially lessen competition and diversity in the media industry, is anti-democratic, and any public benefit is outweighed by the public detriment. MEAA chief executive Paul Murphy said the 1147 submissions passed onto the ACCC by MEAA far exceeded expectations. “It’s a sign of how much this takeover is against the public interest that more than 1100 people felt compelled to send a submission to the ACCC,” Mr Murphy said. “The ACCC must seriously take these views into account when considering whether to allow the takeover to proceed. “This is a takeover that will change the face of Australia’s media forever by creating a cross-platform giant that will reach every corner of our nation and which will control newspapers and websites, television and radio stations in our two largest cities. “There is no question that the Nine takeover of Fairfax will reduce diversity in Australia’s media, which is already one of the most concentrated in the democratic world. “We also hold concerns about what it will mean for independent journalism, for the future of Fairfax’s metropolitan and 160 community, regional and rural publications around Australia, and for the jobs and conditions of thousands of Fairfax employees. MEAA says that if the takeover is allowed to go ahead it should only be with strict enforceable undertakings, including a robust process to guarantee editorial independence, the maintenance of separate Nine and Fairfax newsrooms, and commitments to continue existing employment arrangements and all existing Fairfax publications for at least three years. Friday September 7 2018 – Submissions to the Australian Competition and Consumer Commission’s formal review of the Nine Entertainment Co takeover of Fairfax Media closed at 5pm today. To that time, 1147 submissions had been made from people using the online MEAA web site tool. The submissions made by the public are overwhelmingly opposed to the takeover. MEAA’s own submission will be made available shortly. Wednesday August 23 2018 – Interested parties can make their own submissions to the ACCC review of the Nine takeover of Fairfax via a MEAA form. Thursday August 16 2018 – Nine CEO Hugh Marks says Nine and Fairfax have lodged a detailed submission with the ACCC. Friday August 3 2018 – The takeover of Fairfax Media by Nine further concentrates the Australian media, which, data shows, was already one of the more concentrated media industries in the world. MEAA welcomes this as from day we called on the ACCC to ‘hit pause’ until it had completed that inquiry. “This will be a fascinating review given the considerable changes affecting traditional media in recent years,” Sims said. “Significantly in this matter, we will have the benefit of considerable insight into these changes from our digital platforms inquiry. Wednesday August 1 2018 – In correspondence with MEAA, Nine has again failed to give satisfactory answers on editorial independence. MEAA wrote to Nine CEO Hugh Marks on July 27 seeking clarification of the duration of Nine’s commitment to observe the terms and conditions of current Fairfax enterprise bargaining agreements (Marks said Nine would comply “for as long as they remain in effect”). MEAA also said that it “may be appropriate to discuss matters in more detail”. But Marks ruled out discussions with MEAA “as the deal is yet to complete. Our expectation is that this will happen around December 2018”. Australian Competition & Consumer Commission chairman Rod Sims expects a 12-week “long review” of the takeover that will make a “very careful study” of the impacts it will have, including the effect on diversity of views”. “Our lens is: what does the reduction in competition mean for diversity? What are competitive forces doing to diversity? We will look at quality, price and quantity,” Sims said. Monday July 30 2018 – MEAA issued a statement saying that key questions remain unresolved about how editorial independence would be protected following the proposed takeover of Fairfax Media by Nine Entertainment Co.
MEAA said Nine chairman Peter Costello and his board must commit in writing to the full wording and intent of the Fairfax charter of editorial independence. Nine must also guarantee not to close or reduce the editorial footprint of Fairfax’s network of regional and suburban publications, which serve communities around Australia. MEAA Media federal president Marcus Strom said Nine had a tradition of great journalism, but without a commitment in writing, Fairfax staff had every right to be concerned about whether the charter would be adopted if the takeover went ahead. “The Fairfax charter of independence, established in 1991 when the company was facing an earlier takeover, explicitly prohibits media owners from dictating or interfering in the editorial decisions or journalism of its publications, even if they may reflect poorly on the proprietor or advertisers. “It has allowed the journalists of Fairfax to pursue investigations into powerful influences, sometimes to the detriment of commercial interests, such as the series of stories into banking misbehavior which resulted in a royal commission, and articles about corporate wage theft. The future of the charter of independence is just one of several outstanding concerns about the proposed takeover. “We will continue to push for solid undertakings and guarantees on job security, and we need clear and reliable answers on Nine’s commitment to maintaining current employment terms and conditions beyond the current enterprise agreements at Fairfax,” Mr Strom said. “Even if we assume the best of intentions from Nine management, there will be immediate pressure to merge newsroom functions to cut costs. And Nine has made no guarantees about the future of the regional mastheads, portraying them in some interviews as unwanted assets. Later in the day… ACCC chairman Rod Sims said the commission would scrutinise the takeover. He was reported as saying: “Once we get the submissions from the merger parties, we have given ourselves 12 weeks, which is about as long as we ever take, to go through this in very great detail… So all I can say is we are going to look at it extremely carefully. It’s a very, very important issue… Ours is a competition view, and so competition in advertising, competition as it affects consumers, but one way it affects consumers is the quality and diversity of their media. We will take that into account, because its part of what you are getting here, the quality of news and the breadth of news,” Sims said. MEAA is not satisfied with the response regarding job security. We will continue to push for solid undertakings and guarantees. On the EBA, Marks’ response is encouraging and MEAA acknowledges Nine’s statement about maintaining Fairfax terms and conditions. However, we are unclear as to how long this commitment will last and MEAA will press for clear and reliable answers, and what this means for current EBA negotiations. On the charter of editorial independence, MEAA notes and welcomes Marks’ response, but will continue to seek a written guarantee that the full wording and intent of the current charter will be adopted by the enlarged company should the takeover go ahead. Thursday July 26 2018 – Nine Entertainment Co and Fairfax Media announce a proposed merger which would see Nine take over the Fairfax business and dissolve the Fairfax name. MEAA issued a statement. MEAA said the takeover would be bad for Australian democracy and diversity of voices in what is already one of the most concentrated media markets in the world. MEAA called on the ACCC to block the merger, saying that the ACCC can’t seriously consider the proposed merger until has finished its digital platforms inquiry, which Treasurer Scott Morrison called for in December 2017. If the merger were to go ahead, it would reduce media diversity and potentially undermine the editorial integrity of Fairfax’s mastheads. In addition, MEAA has called for Nine and Fairfax to guarantee that the Fairfax Media Charter of Editorial Independence would be retained, and that there would be no job losses under any merger. Job security — preserving current levels of employment in the merged organisation. Enterprise agreement — honouring the current Fairfax EBA. Editorial independence — adopting the Fairfax Media Charter of Editorial Independence. Representatives of Fairfax journalists met with the company’s executives on Thursday May 11 to seek the company’s intentions. The company has remained firm on its 125 full-time equivalent reduction to staff numbers – that’s 1-in-4 journalists in metropolitan newsrooms. 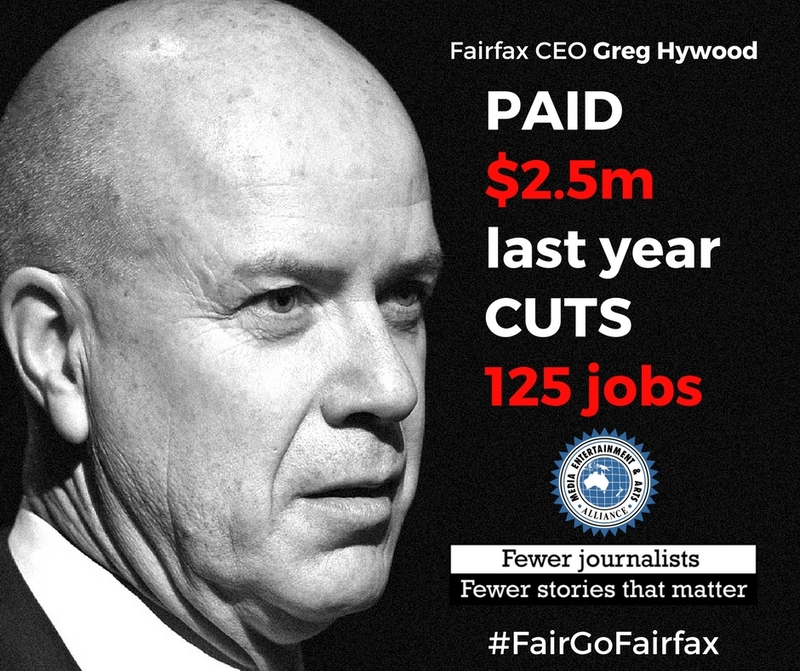 The Fairfax journalists may have returned to work after their seven-day strike action but now they are busy trying to save the 125 journalist jobs (1-in-4) that the company intends to cut as a result of its proposed restructure. Between 2011-2016 Fairfax made at least 470 of its metropolitan daily journalists redundant – as recently as 2016, 120 journalist positions were lost at the metro daily papers as a result of a redundancy round. And those job losses in the newsroom don’t include the attrition that occurred when people resigned from Fairfax and were not replaced. For the journalists who remain, their workload massively intensifies – not least with journalists now having to work on several publishing platforms at once: print, online, social. But as the media industry undergoes massive transformation from digital disruption, journalists who have been made redundant cannot simply step into another journalism job where they can utilise their skills, experience and vast network of contacts and sources. Read this story on The Conversation about the New Beats research project: Life after redundancy: what happens next for journalists when they leave newsrooms. MEAA welcomes the creation of a Senate select committee to inquire and report on the future of public interest journalism in the wake of Fairfax journalists striking over the loss of 125 jobs or 1-in-4 in metropolitan newsrooms. 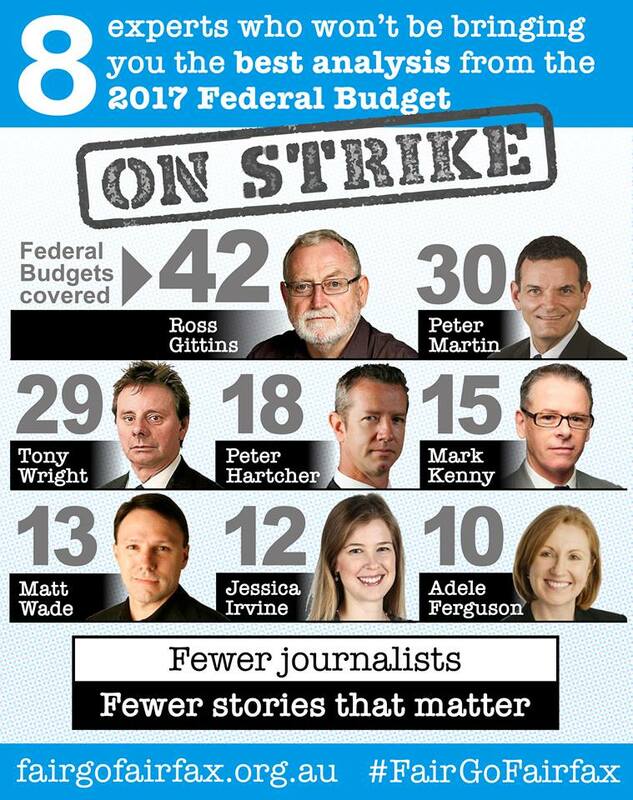 The Fairfax journalists who voted to go on strike for seven days have now returned to work. They have courageously stood up for quality journalism by protesting job cuts that would see 1-in-4 jobs disappear from metropolitan newsrooms. 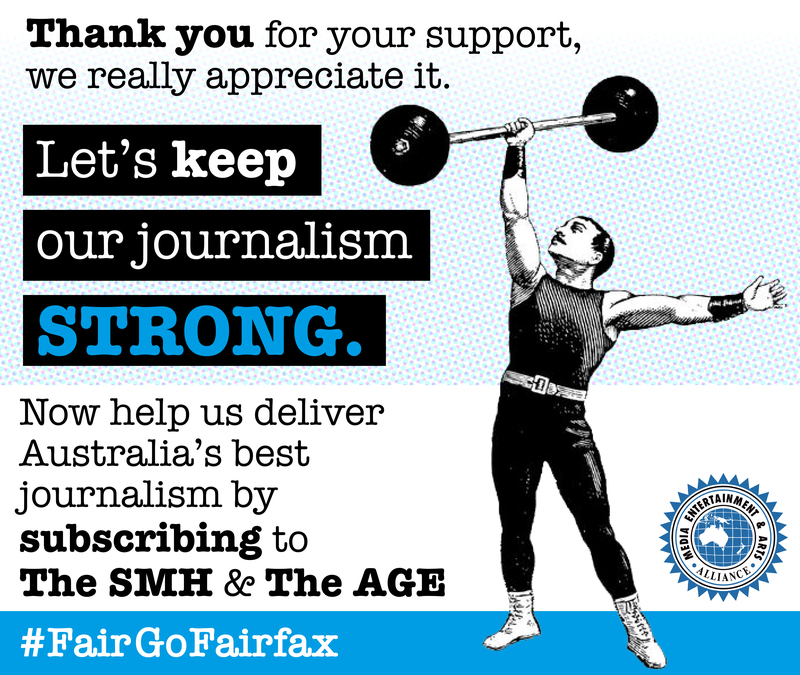 They have stood up, not only for their colleagues, but for Fairfax publications and the audiences they serve. They took a brave stand because losing a further 125 journalists from newsrooms already savaged by years of job losses, cannot continue to produce the independent quality journalism the community needs and deserves. This fight is not yet over – the jobs are still on the line. We urge you to support quality journalism by subscribing to the news media of your choice. Great journalism doesn’t come free. If you value the news you use then please help support and sustain it. Because fewer journalists = fewer stories. 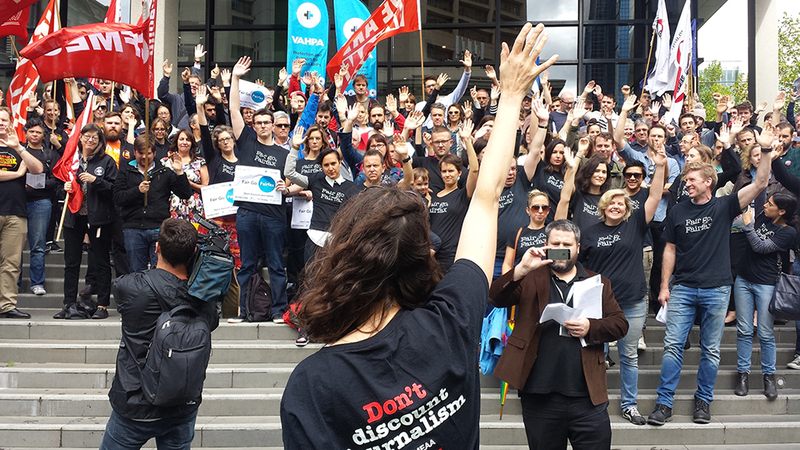 Striking Fairfax journalists will return to work en masse in Sydney, Melbourne Brisbane and Canberra from 9am tomorrow with their heads held high after a highly successful public campaign highlighting Fairfax Media’s harmful proposal to cut 1-in-4 editorial positions or 125 journalists from its metropolitan mastheads. Members will seek to recommence negotiations with the company on several outstanding issues. The incredible public response to our campaign in the last seven days shows the depth of concern in the community about the impact of these cuts, and the support for our efforts to fight for every job. Our campaign has also elevated the debate about the future of independent public interest journalism. Monday was another incredible day of determined campaigning by striking Fairfax staff with plenty of activity from one end of the country to the other. There has been very strong support from among the arts community with videos being circulated far and wide, triggering considerable media attention as people realise what could soon be lost if entertainment and arts coverage is cut. Days of petition signing in Brisbane, Sydney and Melbourne have generated more than 10,000 signatures. Yesterday more than 60 journalists travelled from Sydney and Melbourne to link-up with colleagues in Canberra for a bbq on the lawns of Parliament House. The 2pm rally attracted plenty of media attention and you can see the brief Facebook livestream of the event here. This was followed up with a question on the ABC’s Q&A program about the future of journalism in the face of such massive job losses. 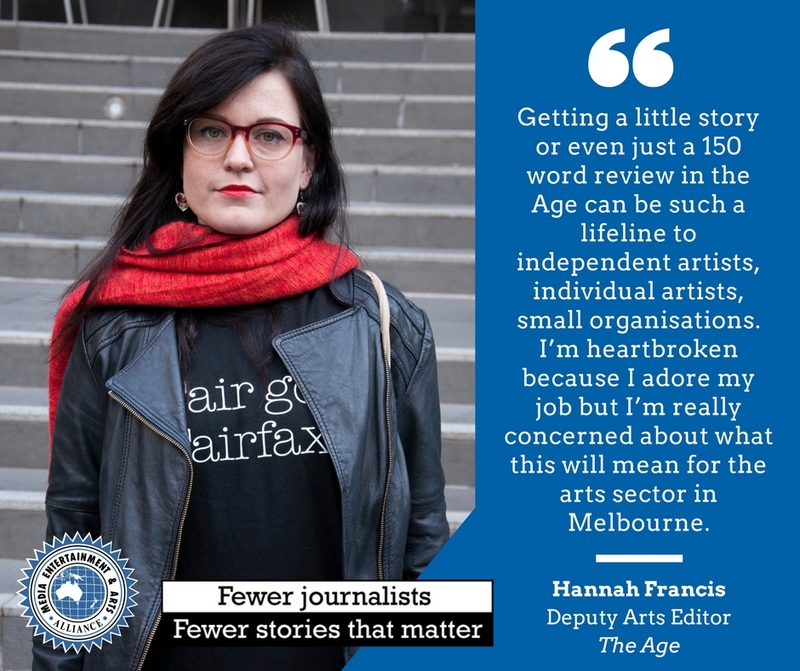 The Fair Go, Fairfax campaign is being supported by many prominent Australians concerned at what the impact of the Fairfax cuts (1-in-4 journalists in the metropolitan newsrooms) will mean – particularly to coverage of entertainment and the arts. They include: film critic Margaret Pomeranz, Sydney Festival director Wesley Enoch, author Peter Carey, Nine Network political editor Laurie Oakes, novelist Charlotte Wood, author and satarist John Safran, writer and actor Marieke Hardy, actor Richard Roxburgh, musician Yael Stone, the Australian Ballet, journalist Barrie Cassidy, comedian Nazeem Hussein, broadcaster Amanda Keller and many others. The journalists’ open letter, addressed to the company’s shareholders and board members, sets out the journalists’ case for the company to act smarter by investing in the company’s quality journalism rather than undermining the company’s products by making yet more radical cost-savings cuts by forcing redundancies on editorial staff. 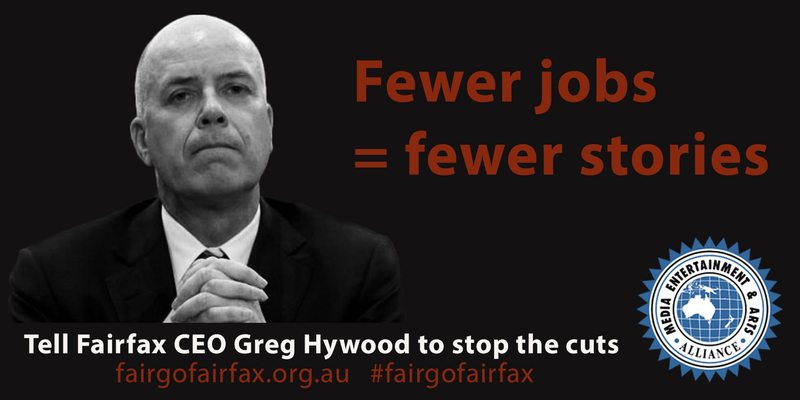 It says the Fairfax board of directors’ strategy of “cutting the way to profitability” is flawed. The letter makes the point that Fairfax businesses flourish because of the company’s journalism and that, because of this, Fairfax should invest in its journalism because it makes sound business sense. The letter cites the plan to float the Domain business as an example. 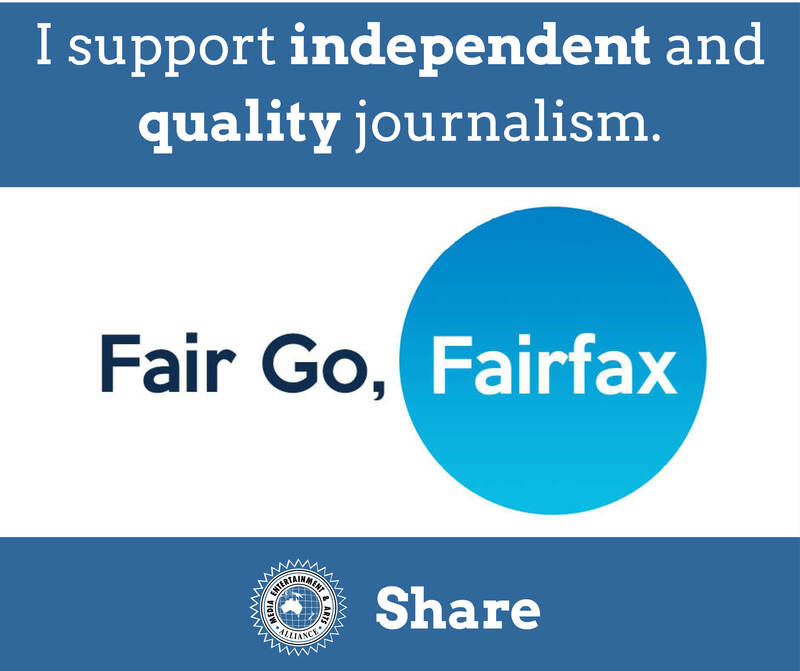 Journalists have been out and about in Sydney, Melbourne and Canberra encouraging public support for the Fair Go, Fairfax campaign. They’ve been talking to their audience who are responding enthusiastically to the campaign by signing pledges and sending emails to Fairfax CEO Greg Hywood. The campaign has been engaging people on social media. Please join us! In stop-work meetings on the afternoon of May 3 2017 – UNESCO World Press Freedom Day – Fairfax editorial staff voted to take industrial action for seven days. Staff are disgusted at the company’s decision to cut 25 per cent of its journalists as part of $30 million in cost savings. The decision means that 125 full-time equivalent positions will be lost. The cuts are so deep that the Fairfax mastheads will have to dramatically reduce their reporting of significant areas of Australian life. • want senior management to take a 25 per cent pay cut. At 10am on the morning of May 3 2017 – UNESCO World Press Freedom Day – Fairfax Media’s management revealed it would cut 125 full-time equivalent positions, or 25 per cent of its journalists, from its metropolitan newspapers. 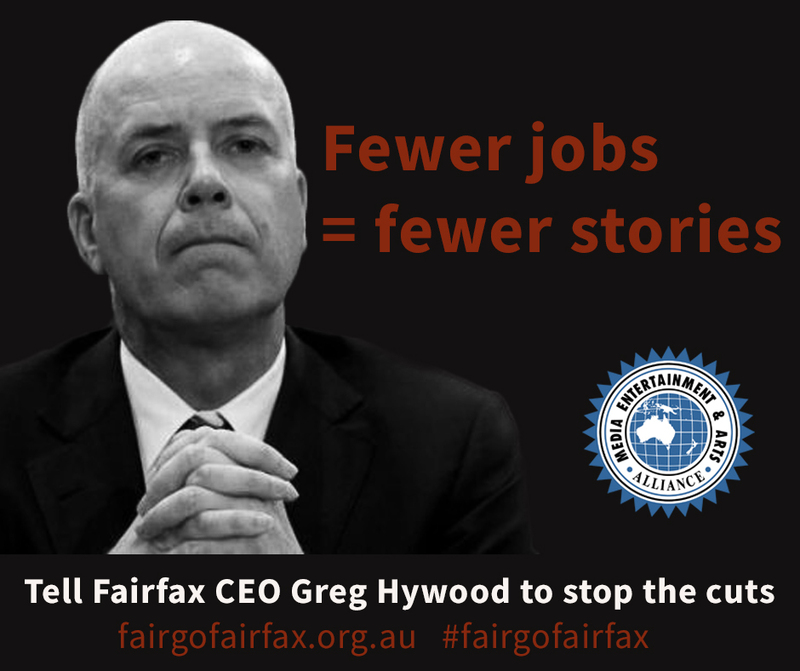 The decision indicates that, yet again, Fairfax is opting for savage cuts that will only weaken its business further rather than investing in its products and working to achieve smarter outcomes. MEAA CEO Paul Murphy says: “None of the other parts of the Fairfax business are worth anything without the journalism and yet it is the journalism that Fairfax always cuts. “This will only undermine and damage its mastheads further, alienating its audience and leaving the editorial staff that remain having to work harder and harder to fill the gaps. This is a dumb decision,” Murphy said. 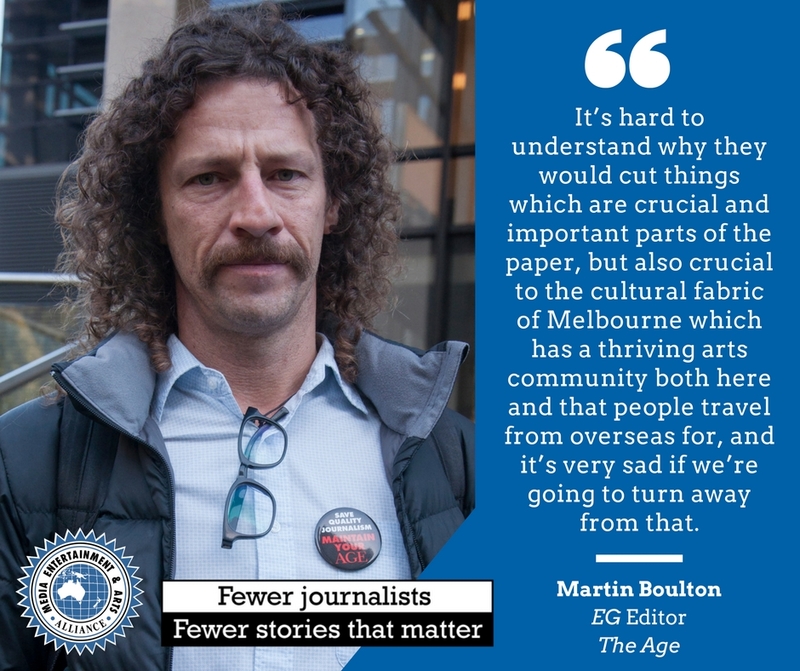 At meetings on April 7 2017, MEAA members in the Fairfax Sydney and Melbourne newsrooms have strongly condemned the $30 million cut to the editorial budget announced by Fairfax management. Journalists called on the company to demonstrate it is serious about genuine consultation with staff to achieve savings while not cutting jobs. MEAA Media section director Katelin McInerney said members on the floor were invested in the future of the Fairfax mastheads and the independence of their journalism. “The Fairfax brand of independent journalism is attracting a record number of subscribers and readers because these journalists deliver the kind of fearless and objective journalism audiences in a post-truth world are so reliant upon,” she said. “MEAA members in these newsrooms are committed to the delivery of fearless and objective journalism. That is why they are calling on the new leadership team at Fairfax to work with journalists at the coal face to find better ways to deliver that news, and find smarter sustainable ways to achieve savings. They reject the old lazy targeting of the very people the company relies upon; the people whose talent, skills and story-telling innovation are the key to the future success of the Fairfax brand of journalism,” McInerney said. The meetings also roundly rejected attempts by management to impose ideological direction and to interfere with masthead independence and their fair and fearless journalism. “The Fairfax motto ‘Independent. Always’ and the dedication of Fairfax journalists to that motto underpins public trust in Fairfax – they believe any departure from that would be a betrayal of the trust audiences put in them,” McInerney said. Look good and show your support for Fairfax journalists by proudly wearing one of these t-shirts! Go to our online shop to purchase a t-shirt for $27.50. We have a limited run of t-shirts in all men’s and women’s sizes, with all funds going towards campaign materials for the Fair Go Fairfax campaign for quality journalism. Don’t miss out on this collector’s item. Go to our online shop to purchase a t-shirt for $27.50 (including postage and GST). Rohan Connolly being a sport and standing up for the cause. Here's respected Age football reporter Rohan Connolly doing the #FairGoFairfax campaign proud. Cutting 125 staff – taking it to 450 people in the last five years – is no way to manage a media company. Thanks to sports reporters from all outlets for your support. Means a lot. 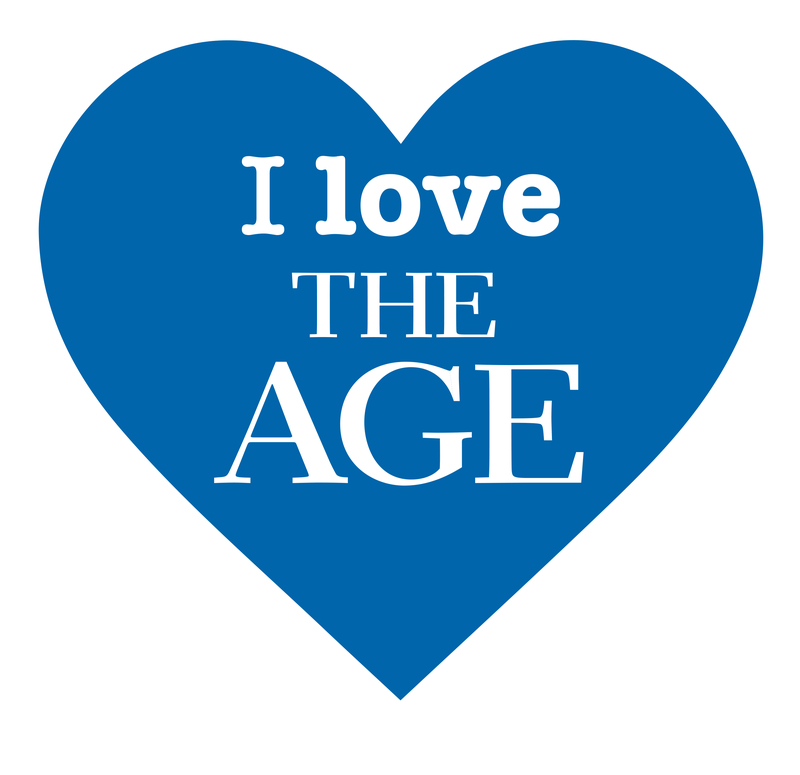 In their own words:Melburnians on why they love their Age.